Those who think that competitive shooting is solely a man's sport just haven't been paying attention. Not only do women compete, they compete at the highest levels. Julie Golob is not only one of Smith & Wesson's champion shooters, along with revolver wizard Jerry Miculek and Doug Koenig, she's the captain of the team. "We have three professional shooters on Team Smith & Wesson who shoot for a living, plus we have 16 other sponsored shooters who have day jobs. We have the biggest team in the industry," Julie says enthusiastically. "As team captain I also work to promote the team and the shooting sports we're involved in." Julie's success didn't happen overnight; it was the result of years and years of hard work. "I started hanging out with my dad at the range when I was young, picking up his brass or spotting his silhouette targets. He was very involved in USPSA, and I would go to matches with him in the summertime. When I was 14 we decided that I was old enough to give it a try, and I jumped right into my first IPSC match. "When I first started it was all local matches in upstate New York. I started out slow. I was all about accuracy, and speed came with time. I went to first my first national championships in 1994 as a junior and was recruited there to shoot for the U.S. Army Marksmanship Unit. At the time they did not have a female in the unit, and it was difficult for them to find a junior female who was willing to join the Army. I love to shoot, and it was an opportunity I couldn't pass up." After leaving the military, Julie did not sit on her laurels. She was a sponsored shooter for Glock before being hired by Smith & Wesson. "I put in a full day every day promoting the team and making sure we have our obligations fulfilled for the shooting sports that we support, and about three times a week I'll try to get out and shoot for an hour or two. It's not a lot of time, but having that little bit of time makes you appreciate it more. It keeps you focused." Julie has even more demands on her time these days. The captain of Team S&W now has a toddler running around her house. "I took about a year off in 2008 because of the pregnancy and feel a little rusty still, but I love it and missed it, so it's good to be back," Julie says. Julie has plenty of advice for women who are interested in shooting and curious about pistol competition. "I think the biggest thing women can get from shooting competitions is that it's all about you against the timer. Yeah, there are results, and you'll see where you end up overall, but at the same time, the only thing you're thinking about when you're shooting is what you need to do and how you need to do it. It's very empowering and exciting, and it's a thrill. I think that encour." Smith & Wesson is selling a "Julie G" version of the M&P semiauto (see last issue's "Speedloads"), but the guns she competes with are virtually identical to the pistols found on any retailer's shelves. "The days of the S&W Performance Center building highly customized Open guns for us to compete with is over; there just isn't a market for it anymore. 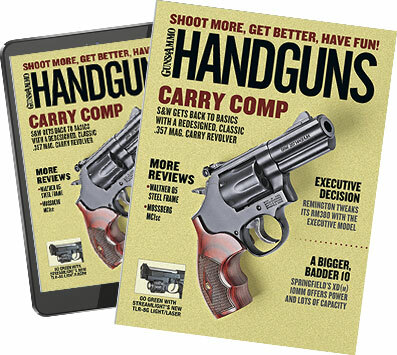 Companies like ours now have guns that can compete in USPSA and IDPA, and that has helped drive the support of shooting sports, especially from a company standpoint. There is now a place for these people to come and shoot, and we're continuing to see a growth in the shooting sports when everything in the news and the economy tells us that we shouldn't."